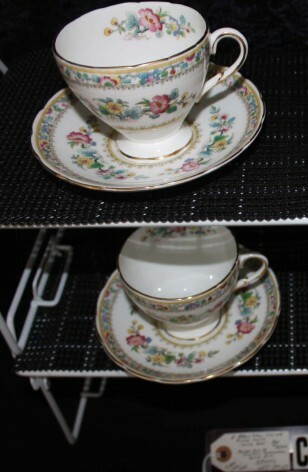 Vintage - Foley Fine Bone China, Ming Rose Pattern #V2310, Duo Tea Setting, Made in England by E. Brain & Co., Manufactured from 1948 thru 1963 - PRICED AS INDIVIDUAL TWO (2) PIECE SETTINGS - Should you desire additional Settings, use the quantity button for your desired number of Sets. This Vintage "Ming Rose" Patterned Duo Tea Setting by the Foley China Company was made in England during the Mid-Century, by E. Brain & Co., LTD. This is a Lovely Ivory China, with Multi-Colored Floral Wreath on the Lip, and in the Center of the Plate Well. The Floral is also seen on the Inside of the Cup, and around the Scalloped Edges. A Yellow Greek Key Design is used as the Verge, and the Pieces are both Trimmed in 22kt Gold. Great Condition. Vintage - Foley Fine Bone China, Ming Rose Pattern #V2310, Duo Tea Setting, Made in England by E. Brain & Co., Manufactured from 1948 thru 1963 - PRICED AS INDIVIDUAL TWO (2) PIECES SETTINGS - Should you desire additional Settings, use the quantity button for your desired number of Sets. This Vintage "Ming Rose" Patterned Duo Tea Setting by the Foley China Company was made in England during the Mid-Century, by E. Brain & Co., LTD. This is a Lovely Ivory China, with Multi-Colored Floral Wreath on the Lip, and in the Center of the Plate Well. The Floral is also seen on the Inside of the Cup, and around the Scalloped Edges. A Yellow Greek Key Design is used as the Verge, and the Pieces are both Trimmed in 22kt Gold. Very Good Resale Condition unless noted below or in pictures.